You all know I love seeing international editions of Aquaman comics, but this cover is truly testing that theory. This is from publisher K.G. Murray, which handled reprints of DC books for the Australian market. Holy cow! What a mess! This is really bizarre. It seems like everyone is crying except Garth and...Kyle Rayner? (that can't be him). Looks like Starro's on the cover, which I don't really understand. And I hope that dark blob isn't supposed to be Black Manta. It more closely resembles headlights and a grille on a car than Black Manta. 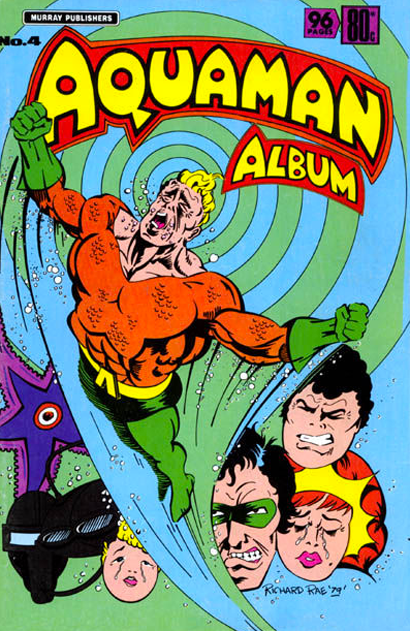 My guess is that this "album" collects the ADVENTURE COMICS stories featuring Starro, Weather Wizard (not Kyle Rayner, haha), and the death of Arthur Jr at the hands of Headlights-and-Grille Man. Wow. I don't know how I forgot about that Starro story, since I own it! Guess it's time for a reread. Weather Wizard makes more sense than disgruntled Kyle Rayner from before he was even created. I'll probably just think of Aquaman's arch-nemesis as Headlights-and-Grille Man thanks to this atrocity. My inner fanboy just died. There should be a tear trickling from Starro's ... orifice.